Boone Brands and Texas Tailgate® launches a “How Do You Dress Your Dogs?” photo contest offering a free* can of Texas Tailgate® Chili Sauce and a $250 Grand Prize. The promotion starts just in time for Labor Day, on Thursday, August 24 and runs through Thursday, September 7, 2017 - visit http://boonebrands.com/how-do-you-dress-your-dogs for more information. Boone Brands, manufacturer of Texas Tailgate® Chili Sauce launched the “How Do You Dress Your Dogs?” photo contest on their social media sites on Thursday, August 24, 2017. Texas Tailgate® Chili Sauce is used as a topping for hot dogs and hamburgers, to create familiar and flavorful Coney Island Hot Dogs, Carolina Chili Slaw Dogs, Chili Cheese Burgers and Sloppy Joes. The “How Do You Dress Your Dogs” promotion offers a free can of Texas Tailgate® Chili Sauce to everyone who participates by registering and uploading pictures of creative ways to enjoy hot dogs with Texas Tailgate® Chili Sauce. All photos received will automatically be entered in the Grand Prize contest to compete for a $250 cash award. 1. Pick up a can of Texas Tailgate® Chili Sauce at the grocery store. 2. “Dress your dogs” with Texas Tailgate® Chili Sauce and take pictures! 3. 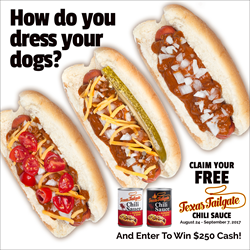 Register at http://boonebrands.com/how-do-you-dress-your-dogs/ and submit pictures of “How You Dress Your Dogs” with Texas Tailgate® Chili Sauce before September 7, 2017. 4. Claim your FREE* can of Texas Tailgate® Chili Sauce. Boone Brands will reimburse up to 89¢ via PayPal®. 5. All photos will automatically be entered in the Grand Prize contest to compete for a $250 Cash Award! Entries may be submitted starting on August 24, 2017 through September 7, 2017 11:59pm Eastern Standard Time. Boone Brands will reimburse all participants for the purchase value of one can of Texas Tailgate® Chili Sauce up to 89¢ via PayPal®. Boone Brands will deposit purchase reimbursements daily. There is a limit of one (1) entry, per valid email address, per eligible person, for the Free Can of Texas Tailgate® Chili Sauce reimbursement offer. The $250 Grand Prize award winner will be selected by an independent judging organization from all eligible photo entries on September 18, 2017. Winner will be contacted by phone or email by September 20, 2017. There is no limit to the number of photos you may submit to be entered in the Grand Prize contest. Visit http://boonebrands.com/how-do-you-dress-your-dogs for more information and official contest rules. Texas Tailgate® Chili Sauce is available in Mild or Hot varieties, both are vegan, contain no monosodium glutamate (MSG) and are Gluten Free. The flavor and texture of Texas Tailgate® Chili Sauce is similar to ground beef, so it resembles a more expensive beef chili at a lower price. Texas Tailgate® Chili Sauce is made with natural toasted soybean grits, spices and tomato paste–its hearty beefy flavor is developed from a vegetable oil product. Since there is no meat in the Texas Tailgate® Chili Sauce it offers a healthy alternative for vegans and consumers who are on a restricted complex saturated fat and cholesterol diet. Recipe ideas for Texas Tailgate® Chili Sauce are available on Boone Brands’ website. Texas Tailgate® Chili Sauce is available at Food Lion, Food City, Wal-Mart, Aldi, Winn Dixie, Lowes Foods, JH Harvey Ingles, Harris Teeter and Bi-Lo in twelve different states: New York; New Jersey; Pennsylvania; Maryland; the District of Columbia; Virginia; West Virginia; North Carolina; South Carolina; Georgia; Alabama and Florida.